I don’t blog here at After Gadget anymore. I moved to SharonWachsler.com over a year ago, but I still get notices from WordPress telling me that new people have subscribed to After Gadget. This post is for you subscribers to tell you my REALLY BIG NEWS and to invite you to subscribe to my ACTIVE blog, sharonwachsler.com because this blog you’re subscribed to here generally has no new content! Moving alone: My big news is that I no longer have multiple chemical sensitivity (MCS), and I no longer have chronic fatigue immune dysfunction syndrome/myalgic encephalomyelitis (CFIDS/ME), and I no longer have chronic Lyme disease and coinfections! Thus, I no longer need a service dog! Barnum has been “career changed” to “demo/training/sport dog” as I work my way toward becoming a professional dog trainer. I am currently interning with two trainers, Caryl-Rose Pofcher and Elise Gouge. I’m learning tons from both of them. Barnum and I have not started our sport training yet. He has had an ear infection for 16 months (no, that’s not a typo!) which has been treated with everything you can imagine, from ointments to oral antibiotics to acupuncture to full-sedation ear flushes. We think this very nasty chronic infection is due to underlying hypothyroidism (already being treated) and food allergies (which we’re sussing out now). This means that he’s on an eight-week trial of ostrich and quinoa. Although I have found ways to do treats and toys with ostrich and quinoa, it’s incredibly expensive and time-consuming, so I’m waiting to do classes with him till the food situation is easier. We will start introducing new foods into his diet in three weeks and see how he does with them. (Yay!) I already know he’s allergic to chicken. I am really, really hoping he is not allergic to beef, pork, turkey, and/or duck. If you want to keep up with me and Barnum, or if you want to know how I recovered my health after 18 years of severe, disabling illness, please check out my current website, SharonWachsler.com. That is where I blog now. That’s where I have info about my writing, consulting, dog training, etc. If you want to skip directly to my recovery story, including “before” and “after” pictures and videos, read the post I published a few days ago. If you want to learn more about neuroplasticity and HOW I recovered, visit my page on neuroplasticity and my recovery. I’ll leave commenting open here for a short time to support ease for readers who are not familiar with my new/current blog, but my strong preference is for you to comment on my new site (so I don’t have to keep logging in and out of two different websites). Thank you so much for your support and interest in my blogging and all-things-dog over the years! I really appreciate all I have learned and continue to learn from you! I haven’t slept since yesterday afternoon. Before that, I slept for two hours, from 2:00 AM to 4:00 AM. Before that, I slept from . . . well, I can’t remember. I can’t keep track of which days are which anymore, even worse than normal, because if I don’t sleep on Sunday until 6:00 AM Monday, does that count for Sunday’s sleep or Monday’s? I’ve had a range of sleep disorders since I first was chemically injured in 1995. In fact, when I was falling ill, I remember having terrible nightmares, every night, and I didn’t know why. Then, as the CFIDS/ME and MCS got worse, I slept less and less until I was sleeping literally no hours per night. Thank god, a doctor gave me Elavil and that worked. Over time, I had to raise the dose, but it helped a lot with sleep and with body pain, as I discovered the few times I had to go off it. And I’ve added other things that help a little. And I’ve tried everything that’s been available for sleep and most of them, I have one of two reactions: 1. No reaction. As if I’ve taken a sip of water. I can take twice the normal dose and feel nothing. I’m wide awake! 2. A paradoxical reaction. This is when you take, for example, Valium, and your body’s response is shaking, sweating, anxiety, racing thoughts, pounding heart. Well, you get the picture. Not sleep-inducing. I’ve been on a vampire-ish schedule for many years. It’s common in people with CFIDS/ME — we don’t “do” morning. But after getting chronic Lyme disease and coinfections, it’s gotten worse and worse. Lately, my body seems to have written a contract which I don’t remember signing that if I fall asleep before 5:00 AM, I will sleep, at most two or three hours, and then I will be awake for another twenty-two or so. Sadly, the less sleep I get, the more pain I’m in. The more pain I’m in, the more exhausted. The more exhausted, the more shaky, mobility-impaired, voice-impaired I am. And all this isn’t even touching on the cognitive impairment: the brain damage from the carbon monoxide poisoning. The brain and neurological damage from Lyme and babesia and Bartonella. These days, I can’t read. Not only can I not read books, I can’t even read long emails. I can’t remember words I used to know. I keep wanting — desperately, desperately wanting — to blog about how torturous it is to be a writer who is brain injured and can’t read and can’t even explain why I can’t read. Can’t explain why my cognitive impairment has gotten so much worse. For a year, I’ve started draft posts here and at my writing blog, about my cognitive impairment and how it affects my writing, and I never finish them. And what makes the level of illness and dysfunction and cognitive impairment I’ve been dealing with even worse is that I now have the desire to write again, to be creative again, which Lyme stole from me for a few years, but I can’t access my creativity. That spark. The place where leaps happen in poetry or fiction. In world-building. In taking risks. Instead, I follow this bludgeoning, insistent mundanity, of persuasive arguments about disability rights or descriptions of training regimes — essentially, “What I did (with Barnum) today.” And I wonder where the other part of me has gone, and if it will come back. One thing I have noticed: Often, when I do my best writing — my most risk-taking, creative writing — is when I am really sick, and often in the middle of the night. But it’s a certain kind of sick. Like, a certain migraine state, if I can write through it, can produce good work. A certain level of disconnection from my body required by, or a result of, pain and exhaustion and cognitive strangeness. These are usually short pieces, because I’m too sick to write anything long, and if I do attempt something long and don’t finish it, when I go back to work on it in my “normal state,” I can’t recapture the spark. It just sits there, unfinished. I have possibly hundreds of such pieces. But, if I’m too sick — if I’m really, really sick — I can’t write at all, and I don’t want to write at all. I have no creativity. I don’t care about anything except the amount of pain I’m in and just trying to do as little as possible — not to breathe or swallow or shift in bed — to get through it. I have no leaping thoughts. I have no desire. To me, this fit with the state I’m in sometimes when I’m sick enough — especially when something neurological is going on, like a migraine, which is believed to be a form of slow seizure, that that shifts my thinking. And it fits why I haven’t been having these spells of creativity — because now, when I’m sick, I’m too sick to write. And my brain is too impaired most of the time to have that plasticity to leap when there are opportunities. It’s filtering out too much. Not just what normal brains filter out, but additional stuff — words, memories, concepts. And then, the bout of really extensive insomnia. It’s coming up on 24 hours since I’ve slept. And I entered two flash fiction contests today. I haven’t done any creative writing for many months, and now, when I literally almost fell over, because my legs gave out when I was transferring from chair to bed, because my muscles are so shaky from exhaustion, I could slip into that place where I could let go, and my thoughts took me places. Are they GOOD places? Is the writing interesting or worthwhile or actually creative? I have no idea. I’m too exhausted to have any clue. But I did it, and that’s something. And it will probably have to be something I remember for a good, long while, because when I crash at the bottom of this crash, it’s going to be a severe, severe crash. I can feel it in the way my body is locking up. So I have a certain desperation to get this post out before it does. If you want to read what I wrote today, I entered the #TuesdayTales contest at GlitterWord, over which you have no control of the outcome. And I entered my original and favorite, #FiveMinuteFiction — and I’m a finalist! So, you can actually vote for me, if you want to. And now I will go to sleep. I don’t know when you’ll hear from me again, but maybe there’ll be a leap somewhere between here and there. What’s in a Name? Lymie, yes. Canary, yes. CFIDSer, yes. Patient, no. The Patients for a Moment (PFAM) blog carnival goes up this Wednesday (gulp — tomorrow!). This was my call for entries. The submissions so far have been fascinating. You can look forward to a great carnival! Meanwhile, here is my post on the topic I picked (and why I picked it). PFAM — which has been occurring twice a month for over two years — was my introduction to blog carnivals. The first time I saw the term, “blog carnival,” was in a call for submissions for PFAM. I immediately found out what a blog carnival was and determined to get involved in PFAM. I have written posts for PFAM a couple of times, but I didn’t contribute nearly as often as I’d intended, and until now, I never volunteered to host. This is in contrast to the disability blog carnival, the ChronicBabe carnival, and especially the Assistance Dog Blog Carnival, the latter of which I founded. The actual goals and membership of the carnival are quite sympatico with my interests — “build[ing] connections within the community of people who blog about illness, disease, and disability” — and I am familiar with several of PFAM’s contributors. But I couldn’t see my way clear to hosting the carnival unless my topic was to question the use of the term, “patient,” itself. Some might find my focus on that single word, “patient,” to be nitpicking. Yes, I’m a writer. Yes, words are important to me, but my feelings about being called a “patient” go beyond semantics. I have a visceral reaction, bordering on revulsion, at hearing myself described this way. To me, the only accurate or appropriate use of “patient” is situational. It is either relational — the person who is one half of the doctor-patient dyad — or it is locational — the person who is in a medical environment (usually a hospital) — receiving care, undergoing tests, or consulting specialists. However, just as often as I read or hear “patient” used in one of these appropriate contexts, I also see it used as a generic term for a person with a chronic illness, condition, or disability. How I react to this usage is determined by who is using it, and how. Specifically, it makes a difference to me if it’s a mainstream/”nondisabled” person or form of media using it, versus when someone with the disability in question is using it about themselves. My reaction to nondisabled/healthy people referring to me as a patient is relatively clear-cut. I don’t like it. Almost every magazine, newspaper, or TV program referring to someone with a chronic illness will refer to them as “patients” — if we’re lucky. Usually, along with references to patients, we are also “struck with,” “afflicted with,” or “the victim of” our disease. That last one really highlights the problem with this kind of language: to be a victim means to have been attacked and helpless, as if the disease has some sort of malicious intent, and we have lost all power and control. Such language supports a perception of people with disabling chronic illnesses as pathetic and different. We are not just regular people, living our lives; instead, we have been singled out for attack, poor things. I am one of a massive movement that has been trying to get writers and journalists to use “person first language” for over two decades, with little success. “Patient” may not technically carry the same weight as “afflicted,” but its usage, its social weight, puts it in the same category as this more obvious “victim” language. To be a patient is to be medicalized and stripped of our identity as people who exist and act outside of medical settings. When I’m blogging about disability or training my service dog or having a phone conversation using a TTY, all of these activities are influenced by my having a disability, but none of them have anything to do with my being a patient. I am not getting medical care as I sit here and type this. I am living my life. Even when, last night, I used my PICC line — a medical device that was inserted into my arm in an operating room — to infuse an antibiotic prescribed by a doctor, I was not a “patient.” I was and am a person living with Lyme disease, managing and treating my disease. I can blog, eat, train my dog, follow Twitter, watch a movie, and/or talk on the phone while I infuse. I am acting, not being acted upon. However, when the visiting nurse comes tomorrow to change my dressing, I will be her patient for the half-hour or hour she is here. 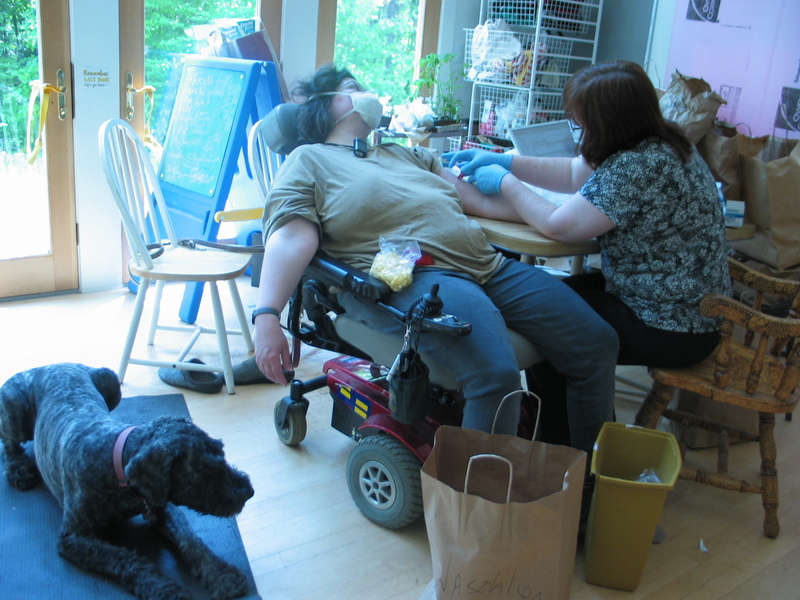 She will be doing to me — flushing my line, cleaning my arm, putting on a new dressing, asking me questions about my symptoms and functioning — but once she is gone, it’s just me in my home. I am not the patient, however, of my personal care assistants (PCAs). I decide what needs doing and how it will be done. They are my assistants, not my nurses; therefore, even when they are assisting me to do what I can’t do for myself, I am not their patient or their client. I am their employer. However, there’s another issue at stake for those with my disabilities, in particular. Myalgic encephalopathy (ME), multiple chemical sensitivity (MCS), and Lyme disease all have histories of being treated as “not real” illnesses. We are told that our symptoms are psychosomatic. We are told the illness is a product of our personality or lifestyle. We are told there is no such thing as ME, MCS, or chronic Lyme, and the labels for these diseases carry these messages. Our diseases are given mocking, belittling names: “Yuppie flu” or “chronic fatigue syndrome” for ME/CFIDS, as if the only symptom of ME/CFIDS is “fatigue.” The chemical industry’s name for MCS is “idiopathic environmental intolerance,” putting the emphasis on the first word — idiopathic — which means “of unknown origin” and removing “chemical” from the name altogether! The Infectious Disease Society of America, which has been prosecuted for conflict of interest in its relationship with the insurance industry, denies that chronic Lyme disease — persistent infection by the bacteria and parasites that cause tick-borne disease — even exists. Instead, anyone who is still sick after a month of Lyme “treatment” is said to have “post-Lyme syndrome,” a psychological response to illness. In other words, words matter. I didn’t need a study to prove it, but there is one. Several years ago, a study about the impact of the name of CFIDS/ME was conducted. A mixed group of fourth-year medical students and medical residents were each given a case study of someone with ME/CFIDS, including symptoms, history, etc. They were randomly divided into three groups. All got the same case study, but the name of the disease was different for each group. One-third of the participants’ patient was diagnosed with “myalgic encephalopathy/ME,” one-third with “Florence Nightingale disease/FN,” and one-third with “chronic fatigue syndrome/CFS.” Those who received “FN” or “ME” cases believed the severity of the patient’s illness was greater than those who had the “CFS” case study. Further, 67 percent of those with the “CFS” study recommended psychiatric treatment for the patient, versus 53 and 48 percent for FN or ME, respectively. I didn’t need a study to tell me that the name of my disabling condition is insulting and misleading, because I’ve lived with that perception since 1995. I have likewise lived with doctors and lay people discounting my MCS as psychosomatic, as a form of “hysteria” or paranoia. Again, this didn’t happen in a vacuum. The chemical industry has been actively working to discredit the experiences of people with MCS — often in partnership with federal agencies and the military — for a very long time. They have money on their side. Then, I got Lyme disease, which I had previously thought was not a “controversial” illness. Once again, money has changed the perception of how this disease is perceived and treated — and therefore how I was perceived and treated (or left untreated). As in the other cases, the name of the disease, “chronic Lyme,” has been dismissed. Given how much people with my conditions have been derided, denied, and denigrated, it is not surprising that most of the individuals and organizations who advocate for us — who try to raise awareness about the validity and seriousness of our diseases — focus on the potential severity of symptoms and systemic injury, and the medical proof of our illnesses — the brain scans, blood tests, or other objective measures of living with an organic disease. Almost without exception, those who do this work refer to us as “patients” — Lyme patients, ME patients, CFIDS patients. One exception is advocacy groups and organizations for people with MCS. Some do use the term, “patient,” particularly those in the medical and scientific fields who are concerned with chemical injury and MCS. However, because most with MCS view our condition as having been caused by being poisoned or chemically injured, and our symptoms as the more severe manifestations of poisoning that everyone would have if the dose was sufficient, not all with MCS even consider ourselves “sick.” For many, it is the rest of the world that is poisonous, and we are just the canaries in the coal mine. Others do identify as ill, as patients. So, when I see “ME patient” or “Lyme patient” on an educational or activist website or blog, I do cringe, but I don’t blame the person who penned the phrase. I think it feeds a need for many of my community to have our real sufferings — particularly our mistreatment at the hands of the medical profession — acknowledged. I much prefer, however, the lingo we have developed among ourselves. As with any subculture, we have created our own “in-speak,” which says more — and yet uses fewer words — than the awkward language of the professionals and the pitying, patronizing, or disputing public. None of this even gets into how I navigate the broader disability community — particularly the disability rights movement arm — using words like “sick,” “ill,” and “disabled,” interchangeably to describe myself. That does not always go over well, let me tell you! But you all have been patient to read this long, dense post, so before you get sick of the topic, I will end, because five other people with chronic illness (who may or may not identify as patients) will be chiming in on this discussion tomorrow! *Starting in 2012, PFAM will move to a monthly schedule, which will make it slightly more doable for me. However, hosts will still be required to give only 10 to 14 days’ notice for bloggers to write and submit a post on that month’s topic. Lead time is my real stumbling block. I was working on “plate zen” with Barnum, which means I’m trying to teach him that all plates, bowls, and mugs are out-of-bounds for dogs. I am trying to teach this as a default behavior, which means I don’t want to have to say, “Leave it,” 80 times per meal. I want him to just know to leave all plates alone. Anyway, I switched back from a blue plate (yes, it was the blue plate special — thanks for asking) and put a clear glass plate in my lap. I waited to see if Barnum would back up. Barnum waited to see if I would give him some clue as to what to do. I didn’t, so Barnum offered, “Chin,” and rested his chin on the plate in my lap. Then, like the gifted and serious-minded dog trainer I am, I fell out laughing. Barnum backed up in confusion when I started to guffaw. Having learned my lesson, we tried again. Barnum rested his head on the plate again. I burst into laughter again. Poor dog. We did eventually actually get to some real training, and he earned some clicks and treats. I am very behind on emails and comments. I’ve been super sick for the past two weeks. I sent out a mass email telling people to please be patient, but there is a problem with my email, and I’m not getting all of them! So, I know at least one person didn’t get that. Anyway, I am not apologizing, but I am explaining. Readers have requested I write on certain topics. In many cases, I have written partial blogs in reply, but I haven’t finished them. In other cases, I feel so overwhelmed, I don’t know how to begin. For instance, many of you have asked what you would need to be able to do to visit me. I am deeply appreciative of the interest you’ve shown in learning about MCS and less-toxic products! I wish I were more able to answer your questions in a timely manner. Another great resource is the video/DVD, Secondhand Scent: Accommodating People with MCS. I’m biased because I participated in the making of this video, but I honestly think it is one of the best tools available to explain to people how and why to become more MCS-accessible. To order the video, please call the Boston Self-Help Center’s message line, 617-277-0080 (voice/TTY), and someone will call you back with details and arrangements. Finally, another video/DVD about living with CFIDS and MCS is Funny, You Don’t Look Sick. This doesn’t provide information about how to become MCS-safer, per se, but before I got Lyme disease and got sicker, it was a pretty good description of my life (except in terms of severity). Co-produced by singer/songwriter Susan Abod, the movie is “an autobiography of an illness.” It gives you an eloquent glimpse into the life of someone with MCS and CFIDS. If you scroll down, you can watch a trailer for the movie on this page. Indeed, Susan is finishing a very important second documentary, which she has been working on for over ten years, right now! (The trailer for this movie, Homesick, is below the one for Funny.) I’m very excited about this. I hope to interview her about that project soon. Enjoy! I am very grateful for the requests for information, even if I’m not always able to keep up with them. Keep it coming! The US Centers for Disease Control and Prevention (CDC) has published a long paper that seems to be based on a conference about the adverse effects natural disasters have on people with chronic fatigue immune dysfunction syndrome (CFIDS, also known as myaglic encephalomyelitis, or ME, and chronic fatigue syndrome or CFS). This is quite relevant to my recent post about how I developed PTSD due to a natural disaster two years ago. This is a lengthy PDF you can download with multicolored graphs and charts and bullet points, oh my! The first 46 pages are not that useful and are somewhat annoying, but there’s some validating stuff after that. For instance, it lists various physical, cognitive, emotional, and behavioral symptoms that commonly arise from stress or trauma. The heading for one page is “In people with CFS, a natural disaster worsens all symptoms of CFS.” Below that are bar graphs that show relevant data. 2. People with CFS usually function better in an emergency and then get much sicker after the adrenaline wears off. (Referred to in the CFIDS world as “crashing”). In fact, I’m going to type out the page that addresses this because I think this is a hard concept for most people to grok: A hallmark of CFIDS is “post-exertional malaise,” which means that starting about 24 hours after any type of physical, mental, or emotional exertion, the person with CFIDS gets much sicker (crashes). These crashes can last for days, weeks, months, years, or forever. It was hard for me to understand when — many years ago — my best friend’s house burned down (she also has CFIDS), and I was also displaced at the time, and we both totally overfunctioned. In fact, she was more functional than I was, and her situation was much worse. We both did things we could never normally do, and we joked about horrible disasters being the cure for CFIDS. Of course, that did not turn out to be the case. Data suggest that the big risk for CFS patients is that disasters can trigger long-term declines in functioning. So, there it is, folks. People with CFIDS have been saying it for decades, but now the CDC has published a document about it. Hopefully this will lend our experiences more credibility in the minds of our health care practitioners, our friends and families, and the general public. It’s not a bad reminder for us to tell ourselves, either. Even though I didn’t lose power due to the storm, I have been more than usually exhausted, in pain, and cognitively impaired since the weekend. I have been trying to power through it (you may have noticed how many blogs I’ve posted, although they were not particularly coherent, pithy blogs), because I am ambitious, bored with being sick, and tend to judge myself harshly for “not being productive.” Good time to remind myself of what I so often try to convey to others: Being sick is a full-time job. When you have to deal with a stressor, like a PTSD flare, you’re putting in overtime. The illness doesn’t like that, and charges you payback. So says the CDC.